The Hepatitis C Trust is excited to be hosting an ‘Art on a Postcard’ fundraiser. All artworks will be on show from 11-13 November 2014 at Whitfield Fine Art, London W1 and available to view and bid for online from end Oct (auction link and auction start date tbc). There is a guest list only evening event on 13 November which will round off the auction, but you can keep bidding online from wherever you are. Contributors include Gilbert and George, Damien Hirst, Cecily Brown, Sam Taylor-Johnson, Jeremy Deller, Gavin Turk, Inkie, Whitney McVeigh and Martin Wilner. Over 200 artists including street artists, illustrators, photographers and tutors and students from the major art colleges including RCA, Slade, Goldsmiths, Chelsea and Wimbledon have also contributed and the quality of the work is exceptional. A full list of the contributors’ names will be circulated before the sale, but the work will be anonymous to all but the winning bidder and not until the auction has ended. Funds raised will go to The Hepatitis C Trust, the only UK charity for people with hepatitis C. The Hepatitis C Trust is the only UK charity for hepatitis C. The work we do covers many areas including outreach and testing, research, representation and support, providing information, raising awareness and policy and parliamentary work. As a direct result of our lobbying the government in April this year early access to new treatments was granted to patients who would otherwise have died. Many patients discover their diagnosis too late and overall only 3% of people with hepatitis C currently receive treatment. We are at a point where despite there being new drugs with a potential to cure everyone with hepatitis C, more people are dying of the disease than ever before. Whitfield Fine Art is keen to support contemporary artists and is delighted to present an exhibition of new work by Claudia Carr. Claudia’s current work explores the territory between ‘still life’ and ‘landscape’ , between the intimate and the epic. She paints from the landscape of debris and clutter, organic material and small plastic animals that accumulate in her studio. Because of the random juxtapositions of objects, specific lighting conditions, and the process of long slow looking and the perception of scale is skewed and the spaces become ambiguous, evoking prehistoric/post apocalyptic wilderness, wastelands, secret gardens and savannahs. A lot of her recent paintings explore the elasticity within grey; the activation of colours within a narrow chromatic range by means of their interaction. The atmosphere of the painting, and the journeys within it, are as a dependent on this kind of optical tension (and other chromatic and rhythmic structures), as they are on the illusory quality of the image itself. Each painting is also the record dialogue with the volatile, fickle nature of visual ‘reality’; the perceptual contradictions that exist in any long stared at scene. 2010 is the 400th anniversary of the death of the painter Caravaggio, who died at Porto Ercole in July 1610. 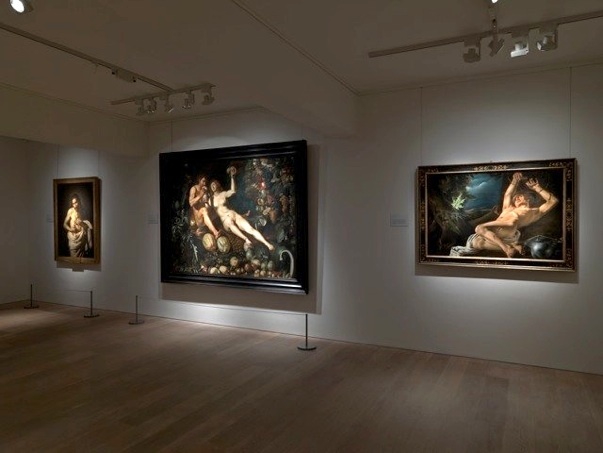 Whitfield Fine Art will mark this anniversary with a major exhibition, during summer of 2010, of important paintings by Caravaggio’s early Seventeenth century contemporaries and followers, with the aim of understanding him through the artists that reacted to this controversial personality. The exhibition will feature works by Caravaggio’s good friends Prospero Orsi and Louis Finson; his great rivals Tommaso Salini and Giovanni Baglione; the painters Antiveduto Gramatica and Cavalier d’Arpino whose studios he worked in when he first arrived in Rome; and his close followers Lo Spadarino, Jusepe de Ribera, Pietro Paolini, Bartolomeo Cavarozzi, Angelo Caroselli and others. The exhibition has an exceptional group of paintings from the Florentine High Renaissance, one of the most creative moments in the Italian art history and one which had an impact far afield. 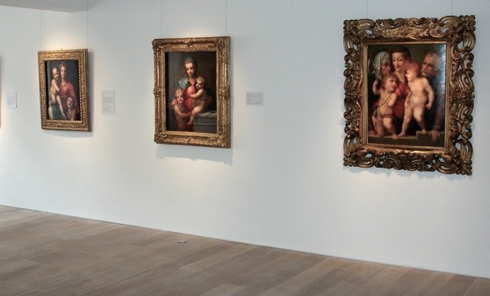 The leading highlight will be the comparison between three newly cleaned masterpieces by Andrea Del Sarto and his pupils Jacopo Pontormo and Rosso Fiorentino painted within a few years of each other. The Andrea Del Sarto “Madonna and Child with St. John” was rediscovered ten years ago, but only in late 2008 was it cleaned and parts of the painting revealed to be completely overpainted in the 18th or 19th century. It has now has it been fully restored, revealed to be in excellent condition and infrared reflectograms have uncovered fascinating underdrawing present on the panel under the paint surface. Painted around the same time, Jacopo Pontormo’s “Holy Family with St John”, was painted as he was in Andrea del Sarto’s studio but as he was beginning to take his first commissions as an artist in his own right. Inspired directly by Andrea del Sarto’s early work of 1513, this panel has been cleaned especially for this exhibition. We shall be also exhibiting a by Rosso Fiorentino. It is fascinating to have his “Holy Family with Saints Joseph, Anne and John the Baptist” as a foil to the Del Sarto and Pontormo, all probably painted within a few years of each other.